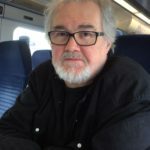 Sean O’Brien’s ninth collection of poems, Europa (2018), was shortlisted for the T.S.Eliot prize, of which he is a previous winner. His book-length poem Hammersmith is to be published by Picador in 2020. His verse translation of Lope de Vega’s The Sicilian Courtesan is to be staged later this year. He is Professor of Creative Writing at Newcastle University and a Fellow of the Royal Society of Literature. It was our last engagement in Berlin. Of dark absurdity we had been booked. And homburgs, with matching black holdalls. Since waiting was what we did best. So which one is meant to be funny? Of Estragon Goldberg and Vladimir McCann. For all I know we may be waiting still.